Father and son play Dragon Quest. Sony Interactive Entertainment Japan Asia has released a pair of new TV spots for the PlayStation 4 version of Dragon Quest XI: In Search of Departed Time featuring actor Takayuki Yamada and his son. In the first TV spot, Yamada can be seen having a tantrum in a game shop, whining “I want to play it, I want to play it!,” and embarrassing his son. Beaten down by his father’s desperate tears, his son agrees to buy Dragon Quest XI, and the pair return home to play it together. 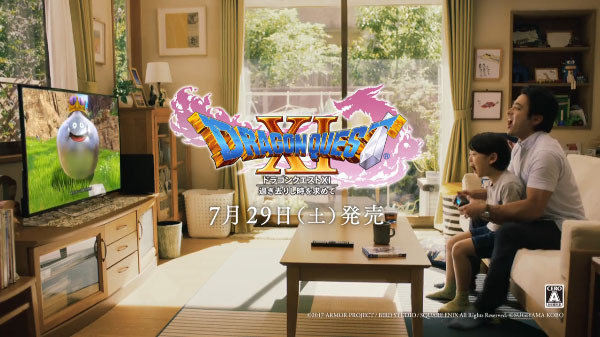 In the second TV spot, Yamada is watching his son play Dragon Quest XI, but desperately wants to play the game himself. “A father cannot take away enjoyment from his son,” he thinks. But he can no longer restrain himself and plops himself behind his son to play the game together. Dragon Quest XI: In Search of Departed Time will launch for PlayStation 4 and 3DS on July 29 in Japan. A Switch version is also planned, but has yet to be shown or dated.